I have a short piece published in the September issue of Urbanite. You can find it under the theme of “Harvest” in the magazine’s What You’re Writing department. 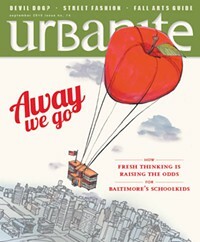 Baltimoreans, there are hard copies of the magazine everywhere–just look for the yellow Urbanite magazine stands.